Must be a current (paid up) member of Aspergers Victoria and logged in with your membership email addresss. Partners and other family members may be registered as a guest under this ticket type. Non-member visitors to an Aspergers Victoria meeting. If you wish to take up a membership instead, please first go to our secure membership portal https://aspergersvic.org.au/join-us and sign up. Then return to register as a Member for this event. For use by teen/children guests of attending AV adult members for this event. Join us to celebrate International Aspergers Day on Monday February 18th. Why not come straight from work? We have a special treat in store - Jacci Pillar will be performing her new show! Note: venue has changed to: Conference Room, Phoenix Park Community Centre, 22 Roby Roy Rd, Malvern East. Recently arrived to live in Melbourne from the Northern Territory, Jacci Pillar is a Comedian and Anthropologist; Autistic-ly solving conundrums people don’t know they have! Her show “Labelled” is a comedic, audio-visual storytelling journey about growing up Autistic and the politics of neurodiversity. It recently toured from Darwin to Alice Springs to finish up at Sydney and Melbourne Fringe Festivals in 2018. 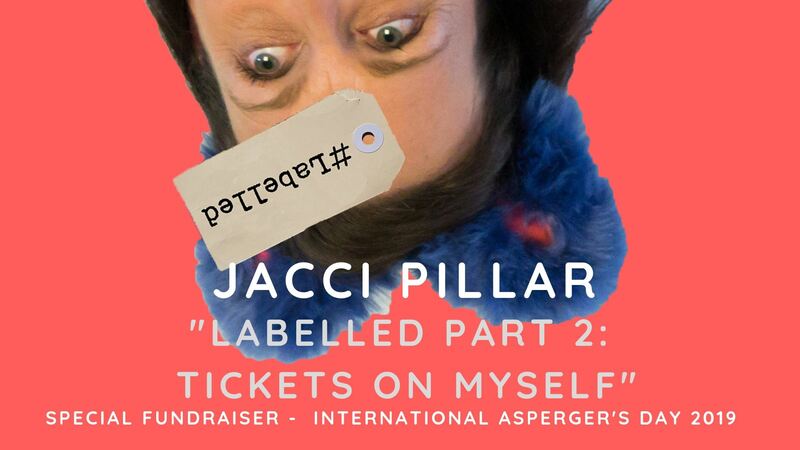 Join us for a new special installment: Labelled II: Tickets on Myself, just for International Aspergers Day 2019. Download flyer here. The second installment of the show is a cheeky look at the Aspergers world from the 1970’s to now and just how far we have come in the way we look at difference as a culture; from the medical model to social model of ability. It’s feisty and educational, with a healthy dose of feel-good funny medicine. Come along and join in our celebrations of Aspergers and our strengths at this fun night, with time to catch up with your peers as well. Thank you to Jacci for offering this show for our community and as a fundraiser to support our not for profit! 8.40 - 9:00pm Refreshments - Tea, coffee, water, biscuits etc. Cost: $25 for AV Members & guests, $40 Non-Members; includes refreshments before and after the show. The show content is suitable for a teenage and upwards audience, so you can join us to celebrate International Aspergers Day in a fun way! If driving: Parking will be available on site at the Phoenix park community centre or in surrounding streets (check signs). On public transport: Take a Glen Waverley line train to East Malvern Railway Station and then walk 1.2km to to be venue. Or the 903 Mordialloc will deliver you close by.